The "Adirondack Northway" is the designation given to the current I-87 stretch from Albany to the Canadian border, running through Albany, Saratoga, Warren, Essex and Clinton counties in upstate New York. Commonly referred to as simply "the Northway," this interstate highway stretch was constructed through a series of extensions beginning in 1957 and lasting a decade until its final connection in 1967. 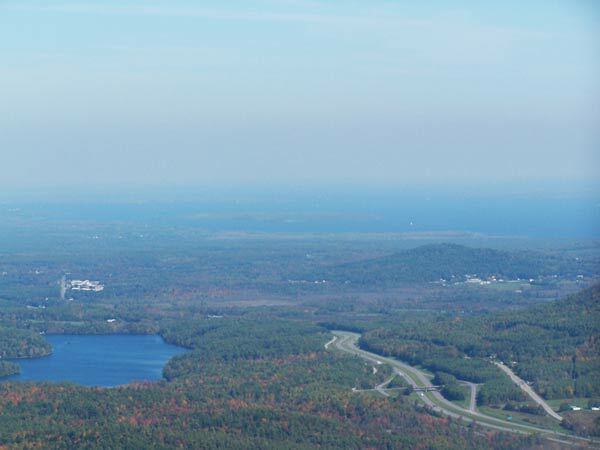 The road to completion, however, was not a smooth one, and plans for the northernmost sections of the Adirondack Northway were met with much opposition. Plans were proposed in November 1959 to extend the I-87 interstate through the blue line boundaries of the Adirondack Park preserve. Since 1892, the Adirondacks have been designated "forever wild" as protected land, so when these plans were announced in addition to corresponding amendments to the New York State Constitution, individuals and groups vehemently rose up in opposition. Most notably, the Citizens' Northway Committee group (led by Chairman Philip W. Ham) spearheaded a campaign against using forest preserve lands to construct the highway. Organized in 1959, they wrote letters to congress, the legislature, the governor and many local government officials as well as conservation groups, editors and even private citizens, stating their ardent opposition to the proposed amendments. Plans for alternate routes were proposed, but ultimately a majority vote passed the requisite amendment to proceed with the connection through the Adirondack Park preserve. By 1966, I-87 extended as far north as Lake George Village where it crossed over Route 9 and routed to Route 9N (Lake Shore Drive). At the time, Route 9 was the principle route leading north of Lake George, winding through the eastern Adirondacks. As northern construction continued on I-87, a group of business owners along Route 9 lobbied for the designation of this piece of interstate as the "Adirondack Northway" in hopes that more people would associate the route with an easy-access trip to the North Country. In late 1967, the final piece of the Adirondack Northway was complete, and the result was an uninterrupted interstate highway that connected New York City to Canada via I-87. Contrary to the hopes of many business owners along Route 9 that the easy access route would bring more business, it actually turned into a real-life Radiator Springs story where interstate travelers zipped along the Northway, saving time and missing many of the treasures awaiting them just off the busy highway. As a result, some businesses could not survive and closed down. Today, Adirondack.net serves as a true gateway to the Adirondacks, allowing area businesses and hidden gems the spotlight they deserve and helping to preserve the local economy. Browse our directory of Adirondack businesses, and discover what you may have been missing as you buzz along the Northway!